Spoiler alert! This blog post contains spoilers! These days, that declaration usually pertains to spoiling the events of a movie or TV series, but today we’re talking about a different kind of spoiler – the one on the back of your car. They are often included on a sportier version of certain models, giving it a cooler and sleeker appearance. But what does a spoiler do? Does it actually have a purpose, or is it just there for decoration? While spoilers can certainly add a dash of cool to some cars, they actually do have a use. Cut out the financial middleman at Gil’s Auto Sales. What is the purpose of a spoiler? First, let’s clear up a common misconception. Spoiler is often mistakenly used interchangeably with what is actually considered a wing or an airfoil. While they look similar, an airfoil or wing looks more like, well, a wing. It stands higher up on the vehicle than a spoiler and actually makes the car perform better than one with a spoiler. So what do spoilers and airfoils do? In short, they exist to give the car better grip on the road by using the airflow around the car to their advantage. As a car moves forward, air flows across the body. At the front, the air flows smoothly, but at the rear, it becomes turbulent and chaotic, and a difference in air pressure in the back will increase the lift of a vehicle. If lifting a vehicle sounds like something you don’t want to happen, you would be right. When air hits a spoiler, pressure builds up and causes a decrease in lift. It also increases drag, but the decrease in lift is higher than the increase in drag, so it is still beneficial. With a wing or airfoil, you do not see an increase in drag, but rather, just an increase in downforce that reduces lift. A car equipped with a wing or airfoil driving on the same track and under the exact same conditions as a car with a spoiler would beat the spoiler-equipped car in a race, and both cars would beat a car without either feature. Is it necessary for sports cars to have spoilers? While it is not completely necessary for a sports car to be equipped with a spoiler or airfoil, it is certainly ideal. Sports cars are meant to go fast and handle curves at high rates of speed, and better grip on the road will increase performance. 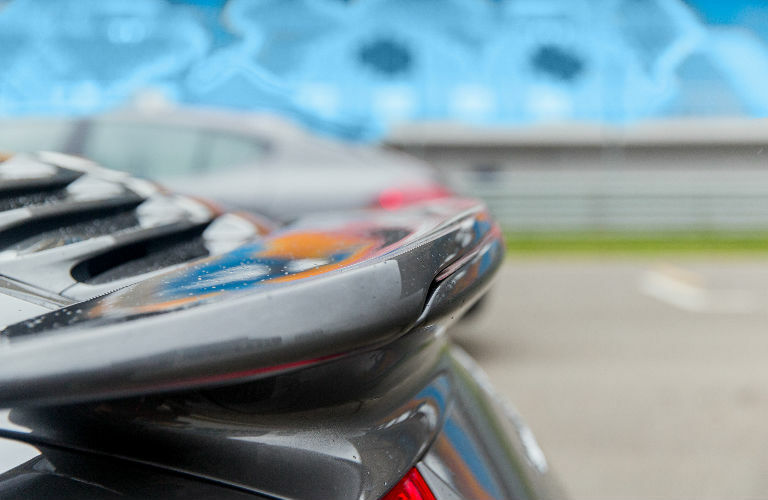 Getting a better grip on the road is possible with a spoiler or an airfoil. We hope this answers one of the automotive world’s most burning questions for you! Stay tuned to the Gil’s Auto Sales blog for more tips, tricks, and fun facts. And please keep Gil’s Auto Sales and its six locations in mind for your next used car shopping experience! When Should you Replace Your Vehicle? This entry was posted on Monday, February 22nd, 2016 at 8:24 am	and is filed under Auto Facts, Informational. You can follow any responses to this entry through the RSS 2.0 feed. You can leave a response, or trackback from your own site. This is very satisfactorily written. The blog post was helpful to elocutionists who exactly possess a good worth for articles. We looking ahead for even more of the very same. He has detailed each and every little thing very beautifully and briefly.